I was in a professional development (for teachers) workshop about two years ago and the discussion about tattoos came up. Should teachers have tattoos? What if they aren’t visible? Two different walls of the room represented opposing views and as the discussion developed, people drifted from one side to the other. I think that as my generation ages, tattoos are becoming so normal. I don’t even get why someone would want a tattoo. Why does a person want something permanently branded on her body? Even so, I toyed with the idea of a tattoo for maybe 2 years. I couldn’t think of the thing I wanted to forever be a part of me. I felt obligated that it should have something to do with my husband – that’s what you do, right? But I wasn’t about to get his name, his face, or his initials inked into my skin. So I thought a symbol of our love might be nice. But I didn’t love the idea of making up a symbol for the sole purpose of the tattoo. No tattoo for me, I guessed. I was in one of those super modern, evangelical Easter services this past year and I was watching the guy up on stage speaking to us and his arms were just blanketed in tattoos. Imagine that. A holy man covered in ink. And then, out of nowhere on that day, an idea for my tattoo sprung into my mind’s eye. I could not shake it. I mulled over it for months, and discussed it with people I loved and trusted. My mom. I didn’t listen to my mom. Getting a tattoo was basically the one thing I wanted to accomplish during my summer off (how immature is that?) and I did. It is such a relief to have it. It is so perfect. It is so me. I will never regret it; I am sure of it. Subtle red-brown silhouettes of my favorite things – my dog, my cat, my horse, a runner – quietly resting on my rib cage. I run my fingers over the ink and realize how lucky I am. My legs can take me distances I never thought possible. I can communicate with my horse in a language even I don’t understand. My dog. Oh, my dog. And the cat for good measure. You know cats – they have to be in the middle of everything. This recipe has been floating around the internet for awhile. It is really, really great. My husband was just blown away – though that might have been because he was coming off a week of eating on the road in Iowa. 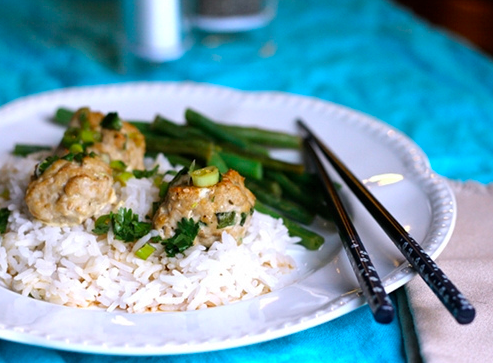 Meatballs aren’t the most low-maintenance thing to make, but they sure are fun to eat. It is nice to have them with an Asian flare and the lime dipping sauce is NOT optional. Combine ground turkey, bread crumbs, egg, salt, scallions, ginger, cilantro, 1 tbsp soy sauce, and 2 tsp oil in a large bowl. Mix with your hands until combined well. Shape into a balls about the size of a ping pong ball and transfer to an ungreased baking dish. Repeat with remaining mixture. Bake until cooked through, about 15 minutes. For the dipping sauce, mix all ingredients. 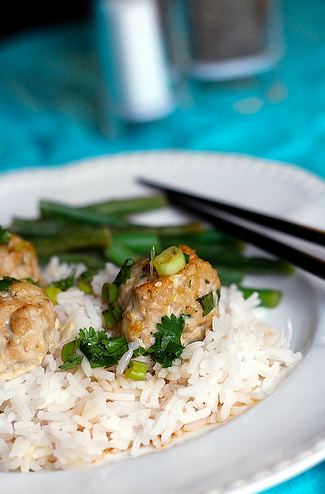 Serve meatballs with drizzled with sauce as desired. This entry was posted in Brady Evans Venables, Cooking, Food, Pets, Recipes and tagged Brady Evans Venables, Columbia, columbia sc, cooking, every woman blog, Famously Hot, food, hospital blog, Lexington, lexington medical center., lexington sc, Lexington Women, lmc, LMC every woman blogger, Midlands, Midlands Women, Skinny taste, South Carolina, South Carolina Women, Tattoos, Women, women's blog, women's hospital blog by Kate Gillmer. Bookmark the permalink.